There are leaders who lead by title only. You know the ones. They push forward through threats of intimidation and power grabs. No one really likes them. Yet they continue to work for them because of fear. People have had titles bestowed upon them for ages. Sometimes they’re right to give the title. Other times they’re not. They give a title so someone who’s looking for power or wealth. This person feels entitled and abuses the title. So much so, others see through the veneer. And they begin to revolt. We can all rule by title. We can’t lead by title alone, though. What’s Better Than A Title? 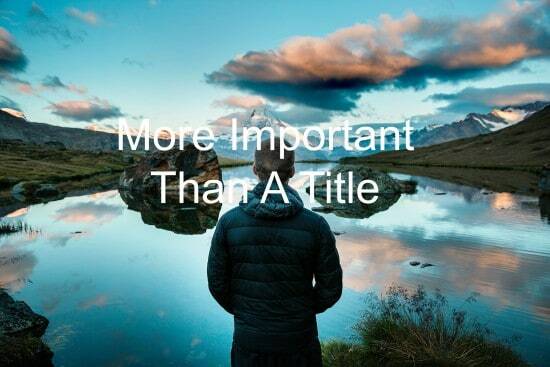 Those who lead by title alone are missing a crucial component of leadership. They’re missing positive influence. Influence is a crucial part of great leadership. We have to be intentional to be people who carry positive influence. It doesn’t happen by accident. Great leaders take steps to gain positive influence day in and day out. Build positive relationships: People follow those they know and like. People are also influenced by the same. Look for ways to build relationships that are positive and help both sides. Care about those you lead: You can lead til you’re blue in the face. It doesn’t matter unless your team knows you care. Take an interest in their lives and hobbies. Let people know you’re there for them. Eat last: We see many people in leadership overlook the fact that leadership isn’t about them. Leadership is about helping others get to where they need to go. This will oft-times require leaders to eat last. What does that mean? It means putting our needs behind the needs of those we’re in charge of. We seek their good, not ours. Remind them you care: While you may truly care about those you lead, there will be times when they forget this. Remind them. Ask about their kid’s soccer game. See how their dog is doing after surgery. Take them out to lunch. These things will reinforce the fact that you care. If we’re honest with ourselves, creating positive influence isn’t hard. These actions are all how we would want to be treated. Who doesn’t want a good relationship with their superiors? Who doesn’t want to be cared for? Who doesn’t want to be looked out for? And who doesn’t like to be reminded that they’re cared for? Let’s begin treating those we lead like we’d like to be treated. Question: How are you building influence with those you lead? Share your secrets in the comment section below.